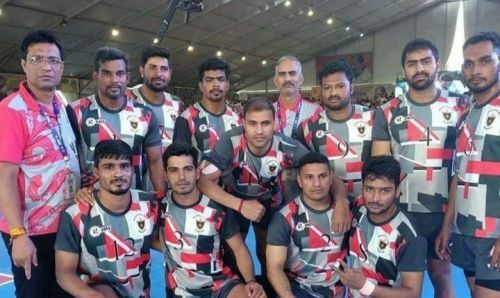 The Indian Railways team clinched the 66th Senior National Kabaddi Championship title, courtesy of a mammoth 41-17 win over Services at the D.G Tatkare Krida Nagari, Roha Raigad, Maharashtra. This is only the second time that the Railways team is winning the title in the last seven years, having won the title last during the 60th Senior National Kabaddi Championship when the tournament was held in Mandya, Karnataka. Maharashtra entered the competition as the defending champions from the 65th edition of the competition, having beaten the Services team when the competition was held at the Gachibowli Stadium in Hyderabad from the 31st December 2017 to 5th January 2018. The Indian Railways entered the semifinals of the competition with a massive stamp of authority, having registered mammoth wins in the league stages (49-19 v Orissa, 53-24 v Goa, 45-30 v Himachal Pradesh) and also a 53-42 win against Karnataka in the quarterfinals. Similar to the Railways, Services remained unbeaten in their league stages and registered their biggest win of the competition against Manipur, when they routed their opposition 69-05, signaling their arrival in grand style. In the first semifinal, Services faced off against Haryana in a game that saw the former dominate at all times. Three all-outs on Haryana dented their hopes of a sniff at a place in the final, which gave Monu Goyat's team a well-deserved entry into the final with a 52-38 win against Haryana. Hosts Maharashtra entered the second semifinal with the 'crowd favorites' tag but were soon dished out some serious treatment. The star-studded Indian Railways team took an upper hand right from the first minute which forced the hosts to retreat into a shell as they appeared hapless against their opponents and succumbed 20-47 at full-time. In the final, Railways displayed their might early in the contest as they inflicted an all-out in -the first half to take a 13-6 lead, which they held on to as the scoreline read 17-9 at the end of the first half. In the second half, Services did well to pick up four points but that was the only highlight in their charge as a second all-out knocked the winds out of their sails as the Indian Railways celebrated their 41-17 win at full-time. With yet another successful completion of the Senior National Championships, Indian kabaddi is sure to be infused with a lot more exciting talent as we gear up for many more kabaddi tournaments in the future.